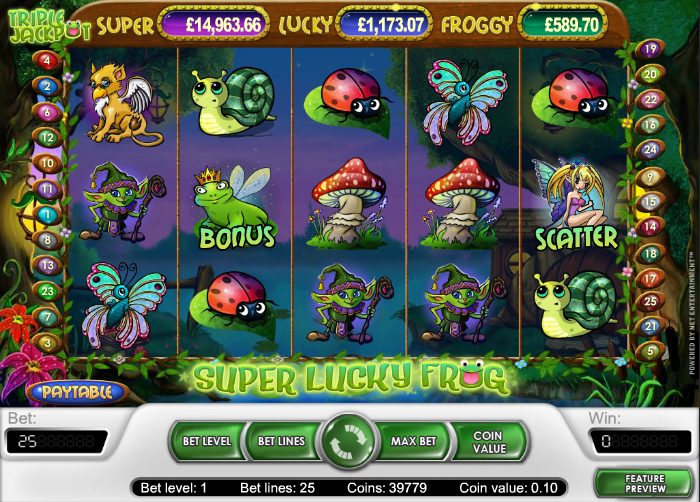 Designing online slots around the theme of cute animals is a popular development path for those who produce the software and Net Entertainment have added to the genre with Super Lucky Frog, a woodland-based slot with some top notch graphics and a progressive jackpot to add to the mix. Super Lucky Frog features five reels and twenty five paylines and those reels are set in a flowery frame through we which we can glimpse a hazy lake under a purple sky. It’s nighttime in the woods and there’s a glow from the window of a small cabin. Mystical and not-so-mystical creatures make up the symbols and we have a snail, a butterfly, a toadstool, a ladybird, a squirrel, some sort of winged dog, a little elf and a unicorn. Special symbols are an elf wild, a flying frog bonus and a fairy scatter which triggers the free spins. A well as winning a decent payout for landing scatter symbols, they will also activate the free spins round. Three, four or five fairy symbols will win you 10, 20 or 30 spins respectively. If you manage this the spins will begin automatically and the value of any winning combos you land will be tripled. Additionally, landing more scatters will add more free spins to the total. The Jackpot Game is where it becomes possible to win one of the three progressive jackpots available in Super Lucky Frog. From low to high value they are the Froggy jackpot, the Lucky jackpot and the Super jackpot. 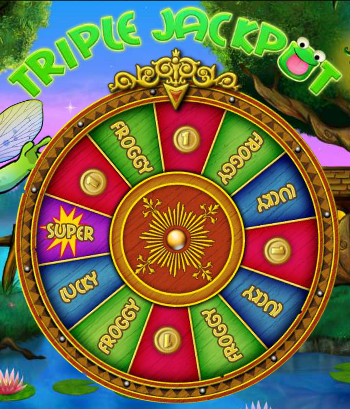 Three of the frog bonus symbols on an active payline will earn you entry to the game and it takes the form of a Wheel of Fortune which you can see on the right. Landing on the golden ‘1’ will win you the amount as indicated in top right hand corner. The higher your stake, the more likely you will be to win the bigger jackpots. Super Lucky Frog creates a nice, relaxing atmosphere and it features the quality of graphics we expect from Net Entertainment. A progressive jackpot always adds to the excitement and this is a slot we’re happy to recommend.